Whenever bows are being discussed, speed will probably be mentioned. Speed can give you an advantage when you are hunting, especially when a large target wanders into view. Since you probably won’t have time to consider distance or angles, being able to instantly let off a fast and powerful shot is often all you need to make a humane killing shot. Since the arrow is traveling at a high rate of speed it will follow a straight line, instead of arcing down due to the gravitational pull that can affect slower moving bolts. While the fastest compound bow can bring down large game, it is important to remember that speed can also have its disadvantages. A smooth draw and inconsistent shooting can be a tradeoff with a fast compound bow, but there are ways you can still have speed, along with an accurate and reliable performance. If you decide for a compound bow, speed might be an issue, but not if you aim for the Elite Archery Impulse 34, a model that leaves behind in the dust many other similar models. Capable of reaching speeds of 340 fps, it is a compound bow that will help you reach your target, and hone your skills as a shooter in the process. You will love the fact that this model comes along with many accessories, such as a 7.25-inch stabilizer that will help you be more precise when launching your arrows toward your target. The quiver supplied by the manufacturer can hold four arrows, which is convenient for most archers if they don’t want to purchase such extras separately. Another thing that archers like about this model is that it comes with a drop away rest, and a Quick-Shot wrist strap release, both extras making things easier for you. At 70-pound draw weight, this compound bow is not a toy, and you can use it for hunting, and not just for target practice. The draw length is 27.5 inches, so ideal for a serious bowhunter. If you want speed, you got it. The Bear Archery Escape can send your arrows flying at speeds of up to 350 fps, and you will also get some extra benefits offered by either the features or the extras that come with this compound bow from one of the most reputable manufacturers on the market. For instance, due to the rubber inserts installed on the riser, you will not only be deadly, but silent, too, as noise and vibrations are eliminated. With an adjustable draw length of 25.5 inches to 30 inches, this compound bow caters to a wide variety of archers, even though it is not precisely a model addressed to beginners. You will love many things about this bow, one being the HingeGuard, which is present for minimizing torque. The riser and the cams are made from aluminum, so they are lightweight and durable. The sophisticated quad limb system contributes to the high performance of this model. 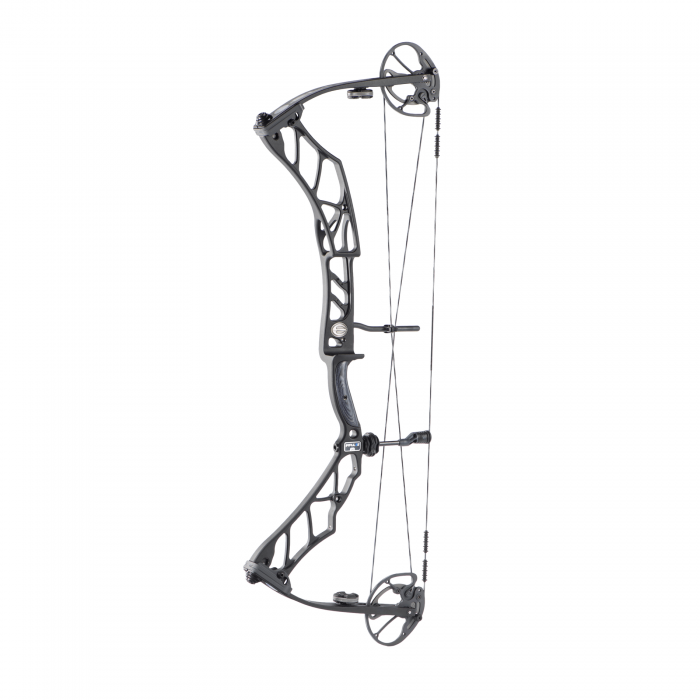 The hybrid configuration helps you draw the bow with ease, without sacrificing speed. At a weight of 4 pounds, it is a bit lighter than other models available. Regarding speed, the Bowtech Prodigy proves why it deserves its name. The maximum speed rating reached is 343 fps, and that, for a bow that weighs 4.2 pounds, it is quite a performance. There are other reasons why you should pay attention to this particular model, as it is available in different draw weight configurations, varying between 50 pounds and 80 pounds. From the first look, you will be impressed with it, as the brace height is 7 inches, so pretty forgiving for shooters of all skill levels. The model comes equipped with something called Powershift, which is a new technology that makes the bow more versatile than most you can find right now. A module installed on the cam system, Powershift allows you to choose from three different configurations. You can opt for speed, for comfort, or for a medium setting that is both fast and comfortable enough. As you can see, you’re getting more than a simple bow. The 80% let-off also contributes to its excellent performance and prevents premature shots when you pull the bow at full draw. With a construction of carbon core and aluminum components, it is a durable model that is sold by the manufacturer with a lifetime warranty. There are a few things any shooter wants to see in a compound bow, and speed is among them. With an IBO speed rating of 338 fps, the PSE Evolve 31 could be your best ally in the field, helping you with both target practice and bow hunting. With a body mass of 4.3 pounds, it might not be the lightest compound bow out there, but, regarding performance, it surely stands head and shoulders above the competition. Both the draw weight and draw length are adjustable, which means that you will get leeway in customizing your bow so that it caters to your shooting style in the best manner possible. The draw weight varies between 60 pounds and 70 pounds, while the draw length goes from 24 ½ inches to 30 inches. Axle to axle, the bow measures 31 inches, so it is quite a compact model, compared to others on the market. The brace height stands a little over 6 inches, which, for the length of the bow, is to be expected. The forged riser is designed to provide extra stability when shooting, while the particular limb system with pockets modified for speed and a RollerGlide cable guard ensure that your arrows will always hit the target. The comfort offered by this compound bow is truly something to write home about. You will get a complete kit so that you are ready to start shooting or hunting. In the package, the manufacturer provides an AMO Pro sight, a Phantom drop-away rest, a Spire stabilizer, a Raven quiver, a neoprene sling, a peep sight, and a nock loop, to make your life easier. Measuring 30 inches axle to axle, and with a brace height just a little over 6 inches, it is a pretty compact compound bow that will impress you with its speed and accuracy. Reaching speeds of up to 336 fps is easy for this model, but the high velocity provided for your arrows is not, by far, the only thing that should make you fall in love with this model from PSE. With 75% let-off, it assists in keeping the bow drawn fully, and the draw weight of 60 pounds also contributes to the popularity of this model among shooters who are serious about their favorite pastime. The draw length goes from 25 inches to 30 ½ inches so that you will have plenty of customization possibilities at your disposal. From the smooth hybrid cam system to the split limb technology used by PSE called X-Tech, this compound bow is a technological wonder. If you’re looking for performance and precision, you can’t go wrong with the BowTech Realm A13465. Featuring a variable draw length that goes from 25 inches to 31 inches, this compound bow caters to shooters who want a hunting weapon they can rely on. Seeing that most people want to use it for hunting, it is no wonder that the model was designed with speed in mind. Its maximum velocity goes as high as 340 fps, so you will be able to take down prey when out in the woods. The model is quite compact for a model with a draw weight of 70 pounds. It measures almost 31 inches, axle to axle, and it is comfortable to shoot. As expected, the bow is a bit heavy, at 4.3 pounds, and seeing how you might want to mount some extra accessories on it, it would be a good idea to pick it only if you know that your physical form allows it. There are a few exciting innovations present on this model, such as the Overdrive binary cam system. This alone contributes to the versatility of this bow, as it allows you to custom fit it for your shooting style. The Orbit Dampener system can counterbalance the weight of accessories, and prevents vibration and noise. One of the ways a compound bow can be made faster is to have a shorter brace height. This affects the draw stroke, and longer ones will increase the stored energy that will be released with the shot. The increased amount of energy will put more power and speed behind the arrow so it can easily penetrate through thick hides, and reach the target before it moves out of range. This is also referred to as the “power stroke”. The distance from the grip’s throat to the bowstring, when it is not draw is the brace height and it is generally measured in inches. For every inch the brace height is reduced, the bow will gain an estimated arrow speed of 10 feet per second. This allows the arrow to travel farther faster, without losing any of its initial trajectory. There is a downside to using a compound bow with a shorter brace height. These bows are often more difficult to use, which can make it a poor choice for beginners. This is due to the increased amount of time the arrow is nocked on the string, which often results in a wobbly release which will affect speed, aim and accuracy. If you want the advantages of speed, without sacrificing performance most experts recommend choosing a compound bow with a brace height slightly taller than 6 inches. Some of the most powerful compound bows that are also capable of shooting arrows at a high rate of speed come with an aggressive cam system. This allows the energy to be stored in the limbs of the bow so you can still enjoy a consistent performance with the speed and power you need to make sudden shots. The design of a cam system is classified by the draw-force curve which is generally mild in less aggressive models. This helps to ensure that the draw is smooth and even from the initial pull to the release. When you are looking for speed and power the cam system should have a noticeably abrupt draw curve, which will results in a faster buildup of energy so your arrow can fly faster with the power it needs to penetrate the thick skin of your target. The disadvantage to a more powerful cam system is that it is harder to draw, which can result in painful muscle fatigue overtime. While there are disadvantages associated with some faster compound bows that include the possibility of sacrificing consistency, there will be times when you are out in the field when it can also give you a slight advantage. You never know when the perfect 10 point buck or large bull will wander into your field of view, and chances are you only have a second before it is out of range. Since you don’t have time to calculate distance and the best trajectory being able to quickly fire an arrow that has plenty of speed and power can help you bag the trophy worthy specimen. A faster compound bow will also fire flatter arrows, which are designed to fly farther without being as quickly affected by gravity. Not only can these arrows cover greater distances, but can also reach the target faster. When a flat arrow is fired from a fast compound bow you will also have the energy needed to bring the target down. Even though there are advantages and disadvantages associated with fast and powerful compound bows, most hunters prefer to have one that is capable of generating the energy needed for their arrows to fly faster. This helps to ensure that they are always ready to take a shot anytime a potential target wanders into view. Thanks to advances in technology and design, the pros of owning a fast compound bow are quickly outweighing the cons. If you want a bow that is accurate, fast and powerful there are a few aspects to consider. Compound bows that measure 6 inches or taller are easy to control, and still capable of releasing the energy you need for faster arrow speeds. Most cam systems are also designed to provide you with a smooth draw, so you have the advantage of speed and accuracy. You also want to consider the balance of the bow. If the bow is off balance it will be almost impossible to make an accurate shot, no matter how much speed and power is behind the arrow. The draw length and string angle should also be considered, but this can be difficult to judge since many fast compound bows come with large cams and a shorter brace. The best way to see what works best for you is to try drawing back several models until you find one that is comfortable to use. A fast compound bow can also be accurate and provide you with a reliable performance, as long as you know what you are looking for. Once you have chosen a bow that is comfortable to handle, you also want to consider the type arrows you are using. When you have the right equipment, almost any hunting trip can be a success.